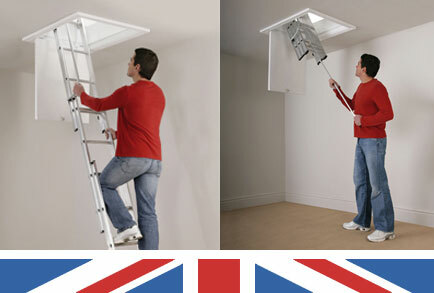 We have been installing loft ladders for over 35 years with over 55,000 loft installations. We are probably the largest installer of loft ladders in the North West and Midlands. The benefits of storing safely all those items that can take up so much of your household space are immeasurable. Suitcases, Christmas decorations, family toys and games, can all be easily and safely accessed whenever you want without the usual method of finding that old rickety step ladder and entering an unsafe dark loft. We offer a free estimate with no obligation. After all your loft represents 1/3rd of your total house floor area, so it's easy to understand why so many home owners are now installing a loft ladder, boarding and lights as an essential part of their home improvement and storage scheme. Why not use all that space in your loft? ... and create extra storage space! * Price may vary depending on area and choice of loft pack chosen.